President Susan J. Hockfield holds an Apple iPad, used for its touch interface to sign a renewal of MIT’s charter, flanked (from left) by Chairman of the MIT Corporation John S. Reed ’61 and former Presidents Paul E. Gray ’54 and Charles M. Vest at the MIT Next Century Convocation this past Sunday at the Boston Convention and Exhibition Center. See page 9 for more photos of the convocation. 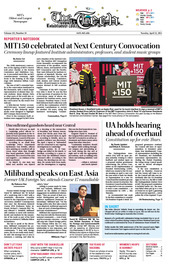 The 150th anniversary convocation of the signing of MIT’s charter took place Sunday at the Boston Convention and Exhibition Center. It proceeded much like an MIT commencement ceremony, right down to the framing of the huge stage with imitation Killian Court columns. Former British Foreign Secretary David W. Miliband SM ’90 kicked off a week-long visit to MIT with a roundtable discussion yesterday hosted by the Department of Political Science. Entitled “Contemporary East Asia,” the discussion featured Course XVII Professors Taylor M. Fravel, Richard J. Samuels PhD ’80, and Edward S. Steinfeld. Miliband will continue to meet with Institute faculty and students for the remainder of the week as part of his brief tenure as a Robert E. Wilhelm Fellow in Residence. The Undergraduate Association (UA) held an open session yesterday evening to collect feedback and student input on a proposed student government restructuring. The Ad-Hoc Committee on the Implementation of Potential Restructuring (CIPR), which was created at the UA Senate meeting on April 4, met over the past week to hash out details on representation in a new UA Council and the transition process from the current UA structure. The Dormitory Council and the Senate are expected to vote on a measure to enact a new constitution — as recommended by CIPR — this Thursday. Shortly after 9:30 p.m. on April 2, Cambridge police officers reportedly heard gunshots in the vicinity of Pearl and Green Streets in Central Square. A search of the area revealed no evidence of gunshots.